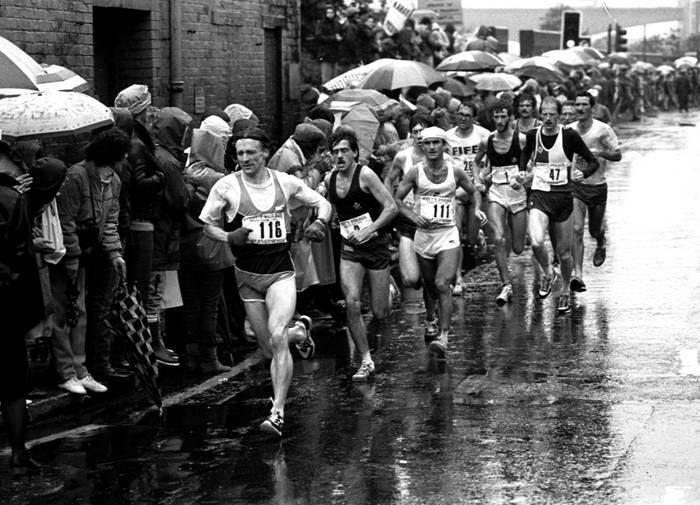 Andy Daly was one of the most likeable runners in Scottish marathon running in the 1980’s and one of the best performers in the marathon. Having come up through the ranks as part of the great group of young Bellahouston Harriers Youths and Juniors teams (Graham Getty, George Braidwood and of course Peter Fleming) he was well known all over Scotland. He was also a very hard trainer and there are several stories to corroborate that. What follows is Andy’s reply to the Scottish Marathon Club questionnaire completed quite early in his career – in October 1983. How did you get involved in the sport initially? Started running at school and gradually became involved in the Harriers. Has any individual or group had a marked effect on either your attitude to the sport or on your performances? Basically the way Foster and Viren used to compete and run had a marked effect on my attitudes and hopefully my future performances in the sport. What exactly do you get out of the sport? Camaraderie and a general feeling of fitness and well being. Can you describe your general attitude to the sport? I love to compete a lot and do well but I am not too disappointed if I am beaten as long as I have given my best. And your worst? I prefer to forget about bad races. What goals do you have that are still unachieved? To run a very fast marathon and still improve my times at 5000m, etc. What has running brought you that you would not have wanted to miss? The good friends I have made and the genial atmosphere at Bellahouston where everyone is willing to help each other no matter their standard. Can you give some details of your training? Training for a marathon. Andy was a remarkably talented and tough athlete. In 1983 when I was accompanying George Carlin to the Essonne Marathon as part of Stuart Easton’s party, Andy came along. He had just run in the Barcelona Marathon as part of the Scottish team that won the team competition and finished tenth in 2:20:09. He had already committed himself to the Essonne trip and kept his word. Clearly tired from the Barcelona trip he came to France where he finished the race in 2:24! The team won the team race as well. He had, to start with, doubted his ability to do himself justice in the race and had the idea of only doing one lap of the two lap course but being third at halfway he just kept on running and although he dropped a few places was still in the first ten at the finish. Two marathons in eight days with a total time of 4:44 is some feat! Andy was a legend as far as hard training was concerned. · A ferocious trainer one of his best quotes was when a club mate once asked Andy how many miles he ran in a week, and the reply was “120 no counting two track sessions!” The other tongue in cheek comment was that he was not a pleasant person to train with as he always did you in no matter what had been agreed beforehand. · On the Essonne trip, he turned up for the bus and when it got to London, the first thing he did was go for a run. The following morning the bus was due to leave at 7:30 but had to wait for a bit until Andy got back from his run. The bus got us to Essonne and the first thing he did was go for a run. Even the morning after the marathon, he went for a run! Normally folk ease up for a bit after a fast marathon! · There was the tale told by Brian Goodwin about the time Andy’s Mum phoned him (Brian) because Andy was very late coming home from his long Sunday run from the Bellahouston Sports Centre. Brian was out in his car looking for Andy and when he finally came home the story was that he had finished his two hours plus run when he met Peter Fleming about to start his session. So Andy just joined in and Brian reckoned that his run that day was in excess of four hours! · Then there is the story that after a Glasgow Marathon where he was disappointed with his 2:18 time so he went for an easy 10 miler at night in about 54 minutes and then did a weights session in the gym where he broke the British Bench Press record for his weight category – something like 280 lbs! Maybe today’s Scottish marathon runners could do with a dose of the Daly spirit. In reply to the “Where Are They Now?” question, Andy is still running seven days a week on the grass at Cartha. If he decides to turn out as an M50 vet, the rest will have a serious battle on their hands!